Bank greed and latent risks. Fish apparently rot from the head down. Australia’s big four banks’ CEOs have helped themselves to monster pay rises over the past twenty years. To help meet their performance targets, staff were financially motivated to sell more products. The Royal Commission into Banking¹ suggests these performance-based increases fostered cultures where greed trumped controls in treating customers fairly. We fear controls may have also lost to incentives when making lending decisions as well. The quandary is poor lending cultures are usually exposed only when conditions deteriorate. For most of the past twenty years, borrowing conditions were favourable. Should mortgage rates keep rising, credit standards continue to tighten and property prices keep falling, though, we may find out if our concerns are well-founded in the next year or two. 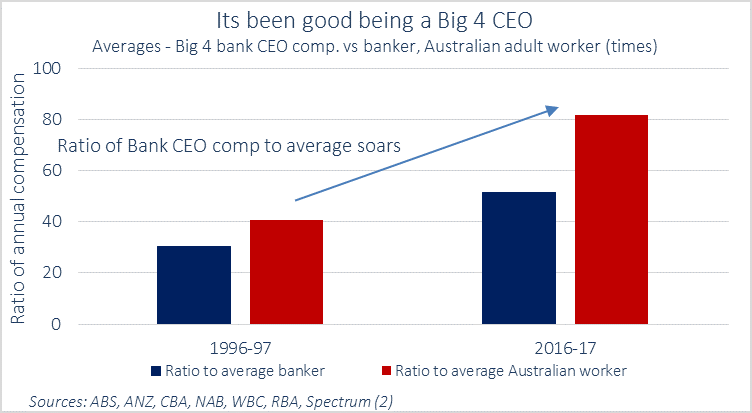 Over the past 20 years, the CEO’s of the big 4 banks in Australia have given themselves double the pay rise of the average Australian worker. Now they earn around 80 times the average employee as opposed to 40 times twenty years ago. They also earn around 50 times the average bank salary as opposed to 30 times two decades previously. So the banks’ profitability is much better? Unfortunately, not. As the table below shows, the banks’ return on equity has fallen from 16% to 13%. True, what you can earn on low-risk assets, such as government bonds, has also fallen. That said, it is hard to see where the doubling of the ratio of CEO performance is justified purely on performance. The big 4 banks have long been very profitable. As long as they do not make lots of silly lending decisions, as they did in the late 1980’s, or chase international dreams, healthy profits are almost assured for Australia’s major banks. The major banks’ low cost of funding and scale gives them a structural competitive advantage over all other lenders in Australia. You could probably put any of the current senior bank executives as CEO of an Australian big 4 bank and the impact on profitability would not be noticeable for some time. You do not need to pay a CEO 80 times the average worker to get solid profits for a large bank in Australia. Yet the senior staff, especially the CEOs, extract oligopoly rents for their services. The scale of the major Australian banks means the large top executive pay packets do not make a large direct impact on the bottom line. For example, CBA paid out $6.3b in salaries for the 2017 financial year. Whether you pay the top band of management in total $30m or $60m makes just a 0.5% difference to total compensation. So if paying the top bankers so much does not make much difference to the bottom line, what is the problem? The problem is culture. CEOs help set the standards and culture for a bank. And the cultures are now at odds with their privileged position in our economy. Due to the points made above, the major banks have a virtual license to make large profits. But with this privilege comes responsibility. Such is their size, their financial stability is pivotal to the health of the Australian economy. Moreover, they are often dealing with customers of moderate financial knowledge. Given this and their privileged market position, a certain level of trust should be expected. However, as the interim Hayne report notes, “The culture and conduct of the banks was driven by, and was reflected in, their remuneration practices and policies” ¹. We believe at the heart of this was the oversized pay increases to bank CEOs over the past twenty years. Governance controls clearly have failed at the major banks on a reasonably wide level. Greed appears to be a clear part of this failure. While anecdotes of this in the past became public from time to time, the scale of examples from the Royal Commission suggests it could be cultural. For lending, we fear there are two areas where greed may have got the better of controls: mortgage broker loans and interest-only loans. These loans may be good for volumes and banker bonuses. For example, interest-only loans climbed from around 15% of all mortgages to currently around a third. As we have written about these in the past – Australian banks – flaunting history and Can the Interest only time bomb be defused? – they may be undermining the overall quality of the banks’ loan portfolios. We are not against either practice per se. It’s just that when this type of lending activity was undertaken in a large scale in other markets, it did not end well – the most prominent being the U.S. pre-GFC of 2008 (mortgage brokers) and the U.S. pre the Great Depression (interest-only mortgages) starting in the late 1920’s. Or maybe for Australian banks – this time is different. At present, interest-only loans account for around a third of mortgages in Australia and brokered mortgages just under 50%. Both levels are worryingly high to us. Whether there was imprudent mortgage lending will only become apparent when borrowing conditions weaken. This could be triggered by higher interest rates, a weaker economy, lower housing prices or a combination of these factors. Perhaps the apparent cultural problems noted during the Royal Commission did not spread to credit risk controls. But this would mean trusting that the banks quarantined greed from lending decisions. Our trust in the major banks is under pressure. We remain underweight Australian banks. ¹ Royal Commission into Misconduct into the Banking Superannuation and Financial Services Industry – Interim Report September 2018. ² methodology of large bank CEO salaries. We surveyed the annual reports for the years ending 1996, 1997, 2006 and 2007 for ANZ, Commonwealth Bank of Australia, National Australia Bank and Westpac. We noted CEO’s total compensation. Where there was a compensation band we took the midpoint. Where the CEO was not named but the top executive compensation was given, we presumed it was the CEO that received it. We took the second largest salary for ANZ in 1997 as the departing CEO received substantial departure pay in addition to normal compensation. ³ methodology of large bank ROE (return on equity %). We surveyed the annual reports for the years ending 1996, 1997, 2006 and 2007 for ANZ, Commonwealth Bank of Australia, National Australia Bank and Westpac. We noted the statutory Return on Equity provided by the banks. We removed the NAB 2016 ROE as we say as an outlier. An ROE of 0.5% was substantially lower than normal due to large one-off charges. Past performance may not necessarily be repeated and is no guarantee or projection of future results. ← Turning tide to reveal more credit uglies.